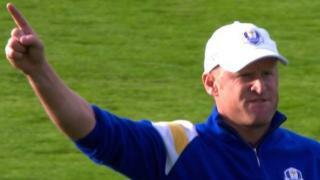 Jamie Donaldson secures the point that retains the Ryder Cup for Europe at Gleneagles. A stunning approach shot to the green on the 15th hole leads United States opponent Keegan Bradley to concede defeat, with Donaldson registering a 4&3 win. Europe have now won eight of the last 10 Ryder Cups.